Follow this link for additional photographs of Tenby by Ben Jones! enby Castle stands on a high rocky headland, in a position of great natural strength, connected to the mainland by a narrow isthmus. Only isolated stretches of the castle walls remain, perched above the sea cliffs, and perhaps a complete circuit of walling was considered unnecessary. Little now remains of the defence of greatest importance, the wall across the neck of the headland, but on the north, a short stretch of well-preserved wall has arrowslits, embrasures and wall-walk surviving, and on the south a similar length lies adjacent to the gate and barbican. A more fragmentary, much-repaired piece lies next to the museum, itself built on to a medieval domestic building, probably the hall. 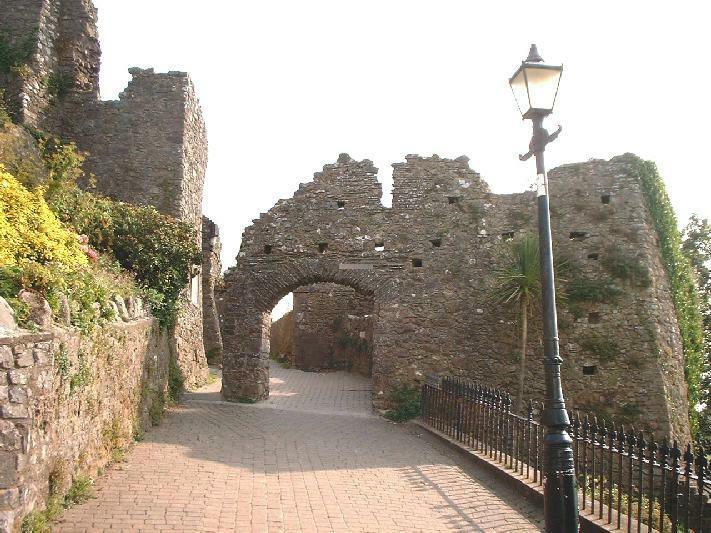 The entrance to the castle is only a simple square gate through the curtain wall, but it is further protected by an impressive D-shaped barbican which sits astride the sloping approach road (below). 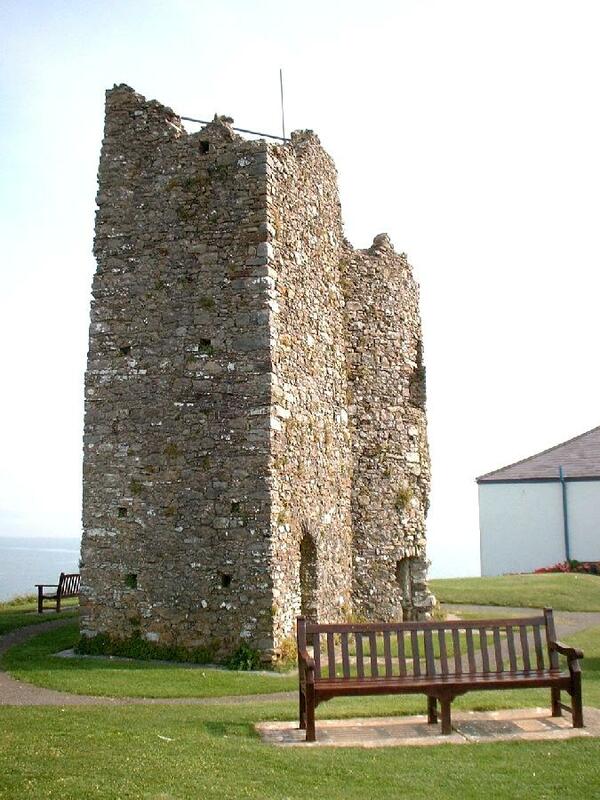 Inside the castle, at the highest point of the headland, is a watch-tower, formed by two small towers joined together. Low footings of what may well be other medieval domestic buildings lie on the landward side of the watch tower. 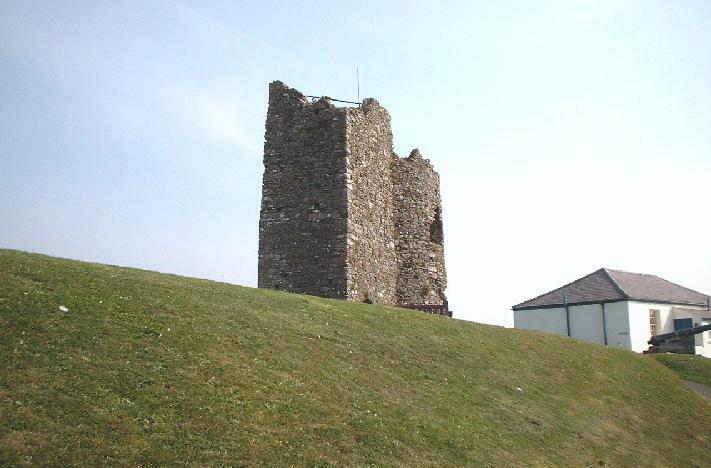 Most of the castle masonry is 13th-century or later, but we know there was an earlier earthwork castle here, and there is a record of its capture by the Welsh in 1153. 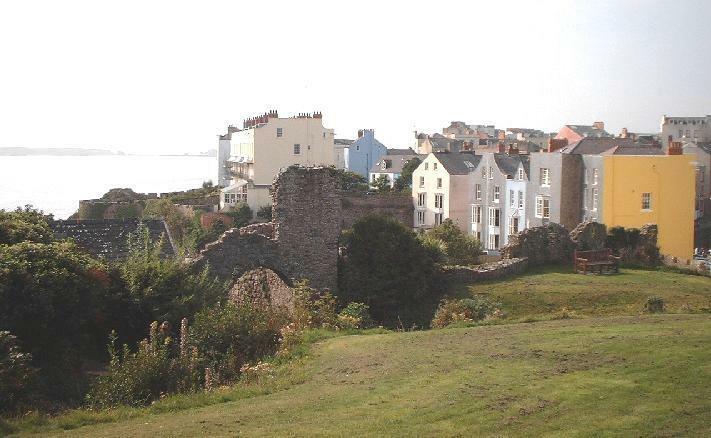 Later attacks on the town of Tenby do not seem to have affected the castle which had probably fallen into disrepair by the 14th century. It did see action in the Civil War when, together with the town, it remained in Parliamentary hands for much of the war, despite two attempts by Sir Charles Gerard to recapture it. In 1648, a unit of Royalist rebels held the castle for 10 weeks but were finally starved into submission by Colonel Horton's besieging forces. While the castle at Tenby is impressive because of its striking position, the medieval town defences are magnificent in their strength and the extent of their preservation. The landward defences along South Parade and White Lion Street are the most complete, save for the North Gate which was demolished. From here, a probably rather flimsier line of wall ran east along the sea cliff to a gate outside the approach to the castle. Another sea wall ran along the east side of town, but, save for one round tower on the middle of the east line, both sea wall and the gate have now disappeared. Of the three gates and twelve towers that originally defended the town, one gate and seven towers survive. Tenby was attacked in 1187 and again in 1260, when Llywelyn the Last sacked the town during his campaigns in the south-west. It was probably after this, in the late 13th century, that the walls were built. The landward walls have been altered by successive rebuildings, and strengthened by a series of towers and by a barbican built around the south gate. Originally, the walls were lower and had a series of arrowslits which could be defended from the banked-up ground inside the town. At a later stage, perhaps associated with a royal grant of tolls for murage in 1328, the famous D-shaped barbican was added to defend the gate. The D-shaped towers north and south of the gate were also added at this time. In 1457, a rather unusual arrangement was agreed upon between Jasper Tewdwr and the townspeople, whereby each agreed to pay half the sum required for refortifying the defences. The moat, which ran outside the walls where St Florence Parade is now, was widened to 30ft, the walls were heightened and a second, higher series of arrowslits was built, reached by a new parapet walk. This wall-walk was supported on arches, so that the original lower arrowslits could still be used from below. 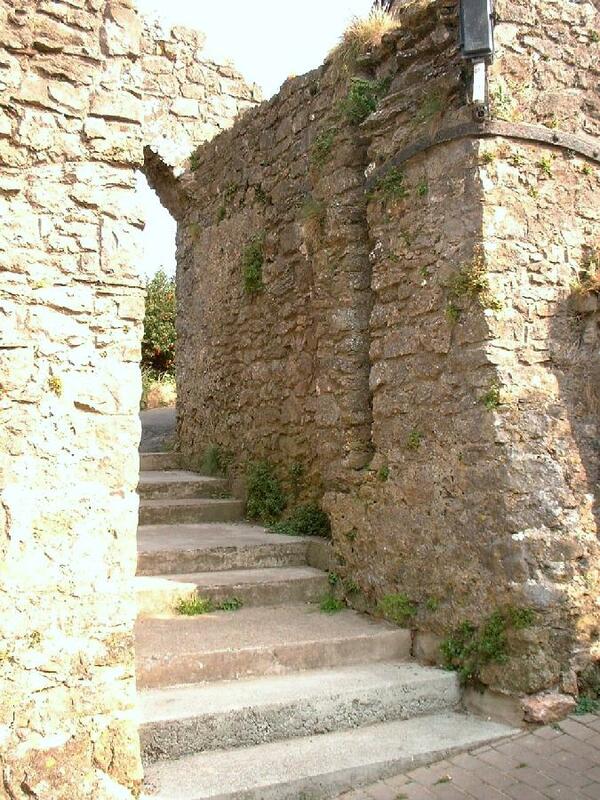 Some sections of the arched wall-walk survive too, but are hidden in the gardens within the town. 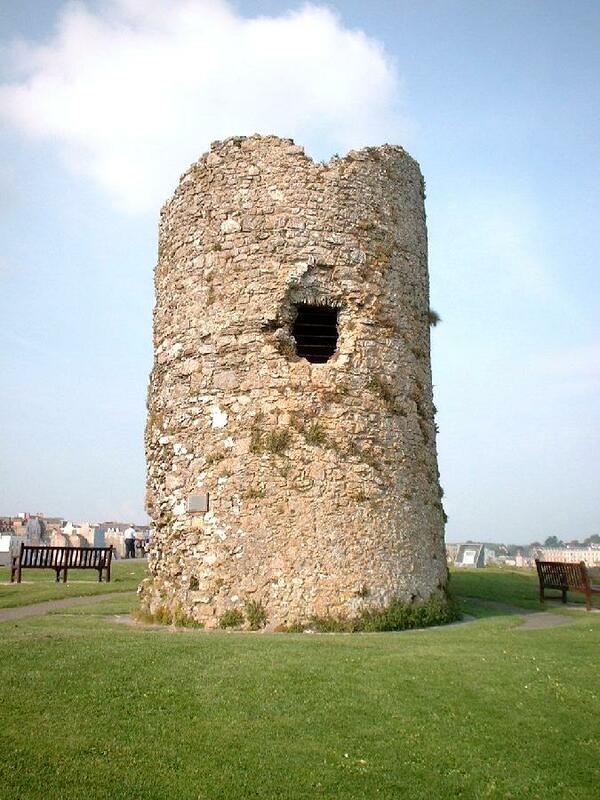 It was at this later stage that the square tower was added to the clifftop on the south of the town, and the large rectangular bastion two towers further north was built with its key-hole gun-ports, fireplace and latrine. A later feature of interest is a date stone near the 'Five Arches' which refers to a rebuilding during the Spanish Armada scare.